This premier 6-night safari visits 2 camps renowned for their excellent predators sightings. Guests will search for predators on Chiefs Island in the Moremi Game Reserve, as well as big game in the Selinda Concession. The focus will be on game drives and night drives with optional bush walks. Guests will be accompanied by expert guides who will create a better understanding of the African bush. On arrival at Maun airport, guests will be met by a representative and assisted to their light air transfer to Mombo Camp where they will be staying for 3 nights on a fully inclusive basis plus game viewing activities. 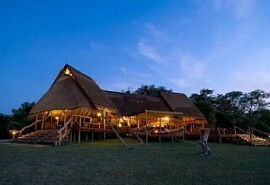 Mombo offers the ultimate in luxury and has been rated by many as the best safari destination in Africa. The area offers huge numbers and variety of large mammals all year round, including elephant and buffalo, tiny steenbok, large numbers of herbivores are followed by their predators, lion, leopard and cheetah as well as a multitude of general plains game. After breakfast and morning activities, guests are transferred by light aircraft to Zarafa Camp for 3 nights on a fully inclusive basis plus game viewing activities. 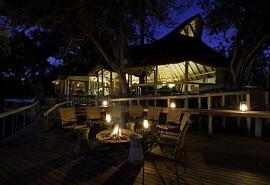 Activities at Zarafa Camp include game drives, night drives and walking safaris. 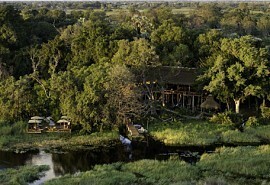 Zarafa Camp is situated in the eastern sector of the Selinda Reserve overlooking the beautiful Zibadianja Lagoon. Abundant plains game can be found here, including lechwe, kudu, buffalo, zebra and giraffe. It is also a predator-rich reserve including cheetah, wild dog, lion, and leopard.